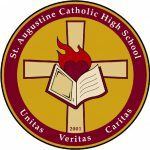 Home > Our School > News > General > Getting Ready for Grade 9 Information Night May 29, 2019 7:00 P.M.
On Wednesday, May 29, 2019 at 7:00 P.M., we will be hosting an Information Evening for parents/guardians of Grade 8 students currently registered to attend St. Augustine C.H.S. in Sept. 2019. Grade 8 students are welcome to attend with Parents/Guardians. Some topics to be covered: School Supports, Student Leadership, Uniforms, Busing, Guidance, Duke of Edinburgh’s International Award, Community Service, STEM+ Focused Laptop Program Information. Next Story Next post: Mental Health Symposium @ St. Robert C.H.S.